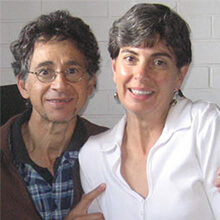 I have had Hepatitis C for almost 20 years but have been symptomatic for the past 10 years. I am 62 years of age. I am a non-drinker and have been for about 15 years. About a year ago my health was slowly deteriorating to the extent where I couldn’t walk to the shop that was less than a kilometre away. 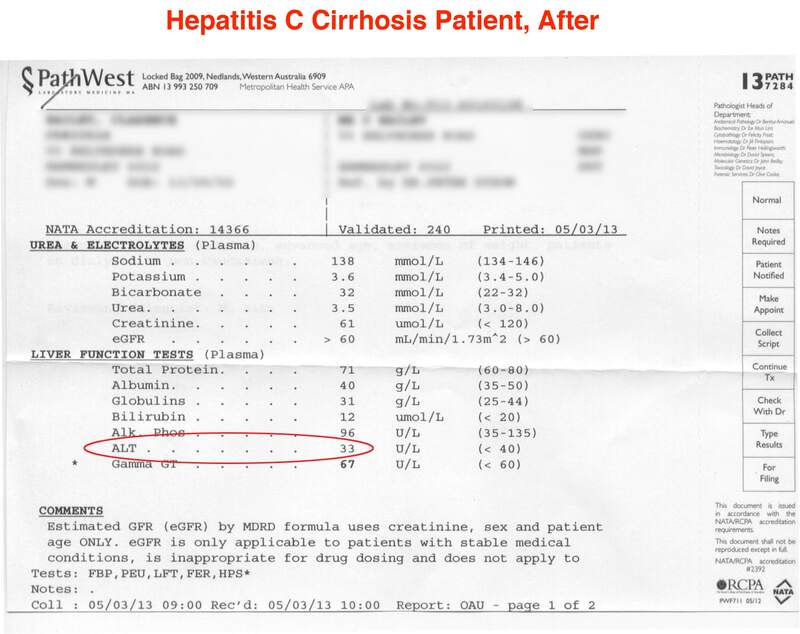 My previous blood test had indicated that my liver scarring was quite significant and after living with Hepatitis C for more than a decade I assumed that this was my lot and a slow fade out was all I could expect. Despite keeping in contact with the Liver Clinic at the main hospital here in Perth, Western Australia, I had not tried the interferon program because I have always been under weight my whole life and now I was down to 47 kilos and falling. I am quite tall really should weigh 60 kilos or more. Accompanying my liver problems I have gastritis, a digestion complaint causing bloating and acid stomach resulting in a very particular diet. Consequently I was advised not to start the program as the loss of appetite that might ensue would result in further weight reduction. One day I typed in “cirrhosis” into Google and it came up with YHK website. After reading a few of the testimonials which included people saying that had had success with symptom relief on YHK for Hepatitis C and cirrhosis, whilst having little success with Interferon. After seeing the size of the tablets (on screen) I suspected that they would not exacerbate my bloating (most pills and capsules do). I sent away for the smallest package and after 2 weeks of taking 6 a day I noticed a gradual reduction of the dizziness that I had been feeling and an improvement in my energy levels. 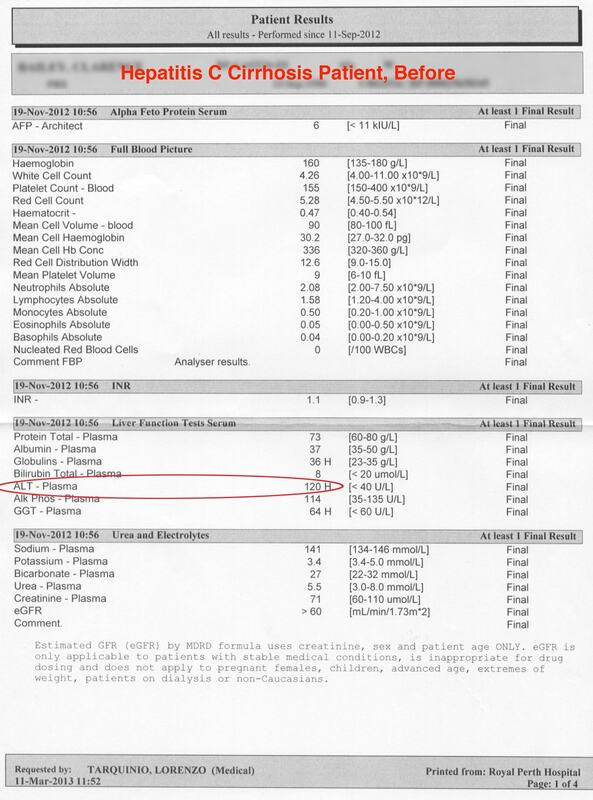 My following blood test indicated that my ALT level had normalised from 120 to 33. I had never seen it this low. There had also been a slight reduction in my viral load. This happened in about 3 weeks with my weight also increasing to 50 kilos. I have yet to find the perfect dose for me, but at present I’m on 2-3 tablets a day. Earlier this year my son had invited me to his wedding in May up in the north west of Western Australia. I had been feeling so bad that I knew I wouldn’t be able to attend, but after starting the YHK Therapy I had improved significantly enough to attend and have a delightful holiday for a week. I’m obviously impressed by the effectiveness of YHK in relation to my condition and would certainly recommend it to anyone with similar symptoms and causes. I must inform that my symptoms have not completely disappeared and I still have to be strict with regards to diet, water, sleep etc., but they seem infinitely more manageable since starting the Therapy. The price, of course is the one thing that many of us using YHK dislike, however I also think we reluctantly appreciate that you pay for quality. I find your service to be first class and with Perth, Western Australia being so close to Japan the time of delivery is about a week which is also very satisfactory. I am curios to hear about other YHK users, their dosage and how they manage their conditions as I try and find my best dosage. Perhaps suggestions as to which chat-rooms to use for more information.